If your IEnumerable<T> collection supports ICollection<T> then all is well, you'll be accessing a property that already has a value. Many times this is not the case. A lot of APIs will only expose collections as IEnumerable<T>. This follows the Frame Design Guidelines to only expose the minimum (base) interface that you need to. In these cases it must iterate over every single item in your collection to get the count. And all that just to decide if there is at least one item in the collection?!? Let’s take a look at the Any() extension method. This would remove the need for the if check. Again, this is decompiled code so it’s possible that the actual code is doing this. So, if you need to know if the collection contains at least one item, and you’re working with an IEnumerable<T>, use the Any() method. If you want to squeeze every little ounce of performance out of your app continue reading! What I find odd is that the Any() extension method does not try to take advantage of the two most common collections, arrays and ICollection<T>. Both of these collections have a ready made property to aid in this effort. Array has the Length property and ICollection<T> has the Count property. By making a new extension method that takes advantage of these properties you can shrink your calls to Any() in half. NOTE: In half is very minimal. We’re talking about ticks, not even milliseconds unless it is called MANY MANY times. If you’d like to test this out for yourself, you can run this console application. In Part 1 of this series I discussed how to create a custom async LoginDialog to use within your Windows Store apps. In this blog, I’ll explain how to turn that dialog into an async dialog that allows for custom content and works more like the MessageDialog. Most of the hard work was already completed in the LoginDialog. It has a constructor that takes content, a ShowAsync method that has the ability to show a dialog asynchronously, responds to a CancellationToken, it is shown as a Popup and responds to the size of the window changing and many more. To create the CustomDialog, I’ll start with the LoginDialog. For the CustomDialog, I wanted to make it almost identical to the MessageDialog class except replacing the content parameter of the constructor from string, to object. For the new constructors, we’ll be using a ContentPresenter to place the custom content. The ContentPresenter will be created in code when the dialog is shown. Matching the MessageDialog also meant added in custom commands to the dialog that allow for a custom action. Also want to make sure that the default and cancel buttons can be specified. /// is the command that fires by default when users press the ENTER key. /// Gets or sets the index of the command you want to use as the cancel command. /// This is the command that fires when users press the ESC key. /// Gets the set of commands that appear in the command bar of the message dialog. When we create the buttons, we need to apply the properties from the custom commands and ensure that the user gets to do their custom action. Now that the dialog has the ability to specify if there is a default and cancel button, we nee to make changes to the KeyDown event of the window. The rest of the CustomDialog is pretty much identical to the LoginDialog. You can download the source and sample application which has both the LoginDialog and CustomDialog in it. If you just want just the CustomDialog class you can download it from GitHub. 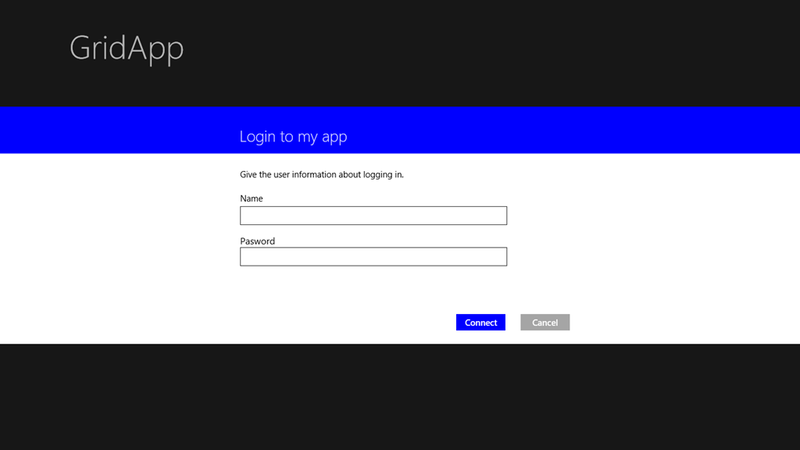 For a recent Windows Store App, I needed to create a way for people to log into it. I could have easily created a simple control or page that allowed the user to enter their login information, but I wanted to work with the new async/await architecture. I thought that creating a login dialog that fit this pattern would be a fun adventure. I wanted to follow the same pattern found in the MessageDialog class so it would be easy to use and understand how it works. This is part one of a two part blog. Part one will cover creating a LoginDialog class that only handles the ability to login. Part two will cover changing that class to be a more generic CustomDialog class that allows for custom content. By the end of the blog we’ll create a LoginDialog that will display a login to the user that looks a lot like the login you get from the People app. This first stab at the dialog will focus on the ability to login, so we need a class that will hold the information the user enters. Notice that this is just a plain class. It is not a UIControl. This means that you cannot place this into your XAML, you can only create and show it from code. The LoginDialog is not a control, but it does need to display a control. There are two ways you could go about doing this. One is to create a class that is the control to display, the other is to create the control in code within the LoginDialog itself. The first is probably the easiest, but I wanted to accomplish this with only one class. I could have made an internal control that is only used by the LoginDialog (and this is the easier way to go and I’ll show using it later) but I wanted to try doing this with only one class. For now I’ll just stub out the creation of the actual control within the ShowAsync method. This method needs to return an IAsyncOperation of type LoginResult. To create an instance of IAsyncOperation you use the static Run method of the AsyncInfo. The WaitForInput method allows me to create the TaskCompletionSource that will be used to return the result. 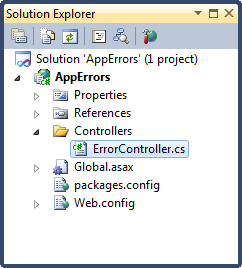 TaskCompletionSource is an awesome class that allows you to set the result at a later time. 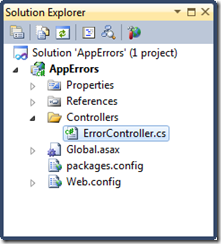 The WaitForInput method returns the Task property of the TaskCompletionSource. This allows for some async goodness. The code will wait until the SetResult method is called on the TaskCompletionSource. To set the result of TaskCompletionSource and ultimately of the ShowAsync method we need two methods, one for when the dialog is canceled and one for when the user has entered their information. The cancel method will handle if the user clicked the cancel button or, if the application cancels the IAsyncOperation within the code. Note: I tried using the cancelation token for the cancel method but that did not do anything. This is the basics of what we need, however windows store apps have so many visual states and sizes to be aware of. This means that the dialog needs to be aware of a few different events. If the app is on a small tablet the dialog needs to adjust for the virtual keyboard. If your app supports portrait the dialog needs to resize itself correctly. We only want to subscribe to these events when the user shows the dialog (within the ShowAsync method), and we want to unsubscribe from the events when the dialog closes (OnCanceled and OnCompleted methods). Another event that is good to listen to is the KeyDown event of the window. If the user presses the escape key you should cancel the dialog. The only thing I’ve left out is the creation of the actual dialog. For this I used a cool github project called XAML Conversion by Petr Onderka. I created the XAML in a user control and used this tool to convert it to code. For the most part it worked really well. It did require that you put children of panels into the Child tag. Download the source and sample application today. This application takes advantage of the light styles I blogged about before. One of the things I love about Windows Store apps is their ability to integrate with the system. One of these integration points is the Settings Charm. I’m not going to show you how to create a settings flyout. There are already lots of examples out there that do this. There are even some helpers like the SettingsFlyout available in Callisto and the helper created by Jerry Nixon. Recently Tim Heuer made a change to the SettingsFlyout to set the background to white. This change allows your app to follow the guidelines. He also added a property that allows you to change what you want the background to be if you are not a fan of white. This change to the background works great if your app has a light requested theme. If you are using the default dark theme then the new background on the flyout becomes a nightmare. It’s a nightmare because now you have to style all of the controls you use for your settings to work properly with a light theme. You could easily start changing the brushes of various properties, but this doesn’t look very polished. You could restyle the controls and start to guess and what colors to use for this or that, but you’ll forget something (at least I did, and it was a lot). There has to be an easy way to get light themed styles at runtime, right? I couldn’t find one, but I did find a way to easily create them. The resources and styles used by controls within the app are generally not found within the app itself. The app requests a theme from the system and that theme has all of resources and styles. This allows you to create custom controls and use those brushes and have the control be styled properly for both light and dark themed apps. These resources are not found within your app, but they are on your machine. The styles and resources for WinRT are found at C:\Program Files (x86)\Windows Kits\8.0\Include\WinRT\Xaml\Design. This folder has two files in it. 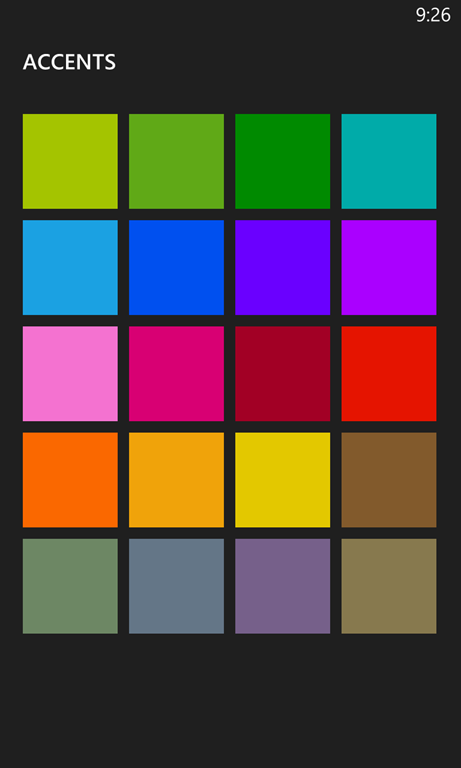 The themeresource.xaml file has all of the brushes, and other resources like font size and opacity. The generic.xaml file has all of these resources as well as all of the styles for each control. We can use these files to build our light themed styles. We then need to add this xaml to our App.xaml. Open the App.xaml and copy the line that adds the StandardStyles.xaml, paste it directly under that line and change the name to LightStandardStyles. Let’s say you need to have a light themed button. Open LightStandardStyles.xaml and also open C:\Program Files (x86)\Windows Kits\8.0\Include\WinRT\Xaml\Design\generic.xaml. Search for TargetType="Button" in the file. Copy the style and paste the style into LightStandardStyles. Give the style the key LightButtonStyle. 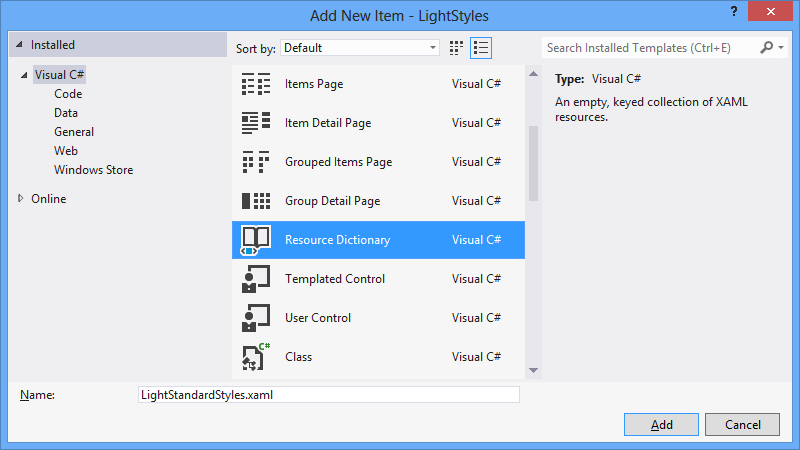 Next open themeresource.xaml and collapse the “Default” and “HighContrast” ResourceDictionary. Now it’s as simple as searching for the brushes used within the button style and copy/paste them from the themeresource file and paste them into LightStandardStyles. After doing this, the file should look like this. With this you can create a light style pretty quickly. But today, and today only, you can download the light styles that I created. This resource file has light themed styles for the ToggleSwitch, TextBox, ComboBox, Button (including a LightAppBarButtonStyle) and all of the standard TextBlock styles.